Compressed format files, like for example, the ZIP extension files require an expander to be launched. Others like the ISO extension files also require to be burnt onto a CD/DVD to be able to work. The only solution to avoid the decompression and burning of these files is to mount virtual units. This task can be rather difficult with some applications, but that isn't the case with Pismo File Mount. A free lightweight application that is capable of mounting a wide range of compressed formats in virtual folders, thus avoiding their extraction. 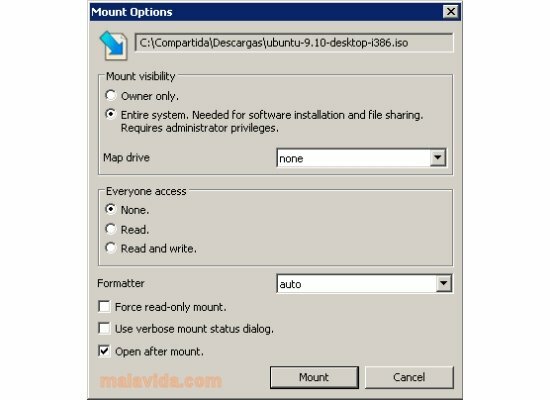 - Mount virtual folders with encryption possibilities. - Quick use thanks to the "Quick Mount" option that will appear in the context menu when right clicking on a file. - Convert CD and DVD images to ISO, CISO and CFS formats, with the possibility to use ZIP or LZMA compressed, and CRC32 or SHA256 validation. - Creation of files in CFS (Compact File Set) format from a folder. - Generation of self-launching virtual folders. - Support for images in the following formats: ISO, CISO, CFS, DAA, ISZ, IMG, DVD and BIN. Pismo File Mount is very useful if your aren't interested in burning certain CDs or DVDs, and to avoid decompressing certain files to your hard drive.